Parenthood Got You Down? You're Not Alone : The Baby Project NPR's Alan Greenblatt wishes parents would put aside, just for a few minutes, the earnest need always to say how great parenthood is. Because, if we're being honest with each other, sometimes it is miserably hard. 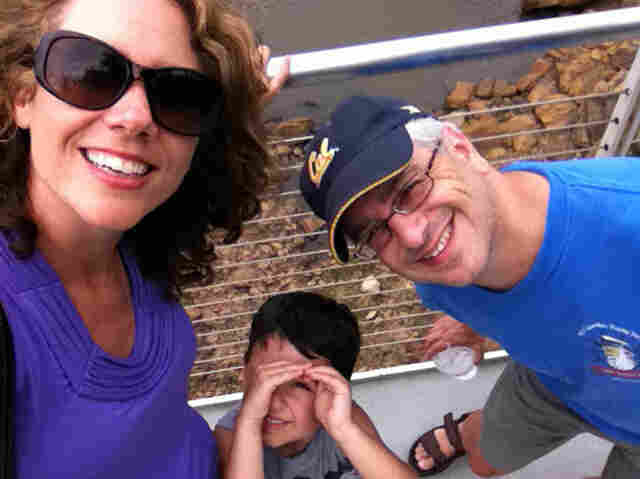 NPR's Alan Greenblatt, shown with his family, says that on some days, parenthood is not all lavender and honey. Can we all agree on one thing? Having a baby is not just a fabulous, enriching experience that opens up your capacity for love and endless opportunities for personal growth. It's also miserably hard work. A baby is like the worst houseguest ever: endlessly demanding, keeping you up at all hours, needing to be fed and making a mess of the whole place. And the little darling never leaves. People don't talk about this enough. It's really hard, being a parent. At times, it's crushing. But you're never allowed to say this. Admitting that the kids are wearing you down — even if you carefully point out that you're just going through a bad patch and will probably be fine in an hour — seems to be taken as some kind of statement that you don't love them. Lately, we've been visiting friends who have newborns — newborn twins, or new babies following behind other still small, still needy children. The parents are clearly so worn out. Their eyes tell the whole story. But rather than saying, "I am this close to losing it," their voices get a little high and they say things like, "Well ... he really is beautiful ..."
Parents allow themselves only the most generic of complaints. This is one reason why there's so much talk about diapers, which are basically impersonal — no comment on my child in particular — and, ultimately, a fleeting problem. They may cop to not getting much sleep. But they never follow up by saying, "I'm so exhausted, I feel like I'm not going to make it. I really do believe at this point that sleep deprivation is torture." People feel the need to extol the joy a child has brought into their lives, even and especially at those moments when their frustration or anxiety might be at its peak. Embarrassed at having admitted any weakness at all in their parenting game, they try instantly to brighten and say, "But it's the best thing we've ever done." No. Not always. Let's be real. There are countless times when being a parent is genuinely a struggle. You are going to be tired. Your relations with your spouse or partner will get strained. You will have to give up things you used to enjoy. Your child truly has nothing better to do some days than to try to wear you down, whether it's to test loopholes in your no-cookies-before-dinner policy or simply to say "no" to every question you ask, even if it's, "Do you want to go to the zoo?" I don't mean at all to suggest that having kids is bad. Just that sometimes it can get you down. Parents do themselves — and their peers — no favors by pretending otherwise. In contemporary culture, we're able to share almost every other type of problem. Say you got mugged — all your friends will tell you their crime stories. Admit that there are members of your family with mental illness, and you'll be amazed how many people struggle with the same issues. But parents are not expected to complain, to say how — maybe just on this particular day, at this very hour — it's not all lavender and honey. Instead, a creeping feeling of inadequacy and social isolation only makes those bad parenting days worse. Parents: Let's make a deal. Let's be honest with each other, or at least one friend, that there are times when the whole enterprise feels like a bad idea. Let's be less alone with this and maybe even laugh about it, putting aside for just a few minutes the earnest need always to say, omigod it's so great. It seems only fair. The one thing we all do is complain about our parents. Alan Greenblatt, a correspondent for NPR.org, is happy that his son just started kindergarten.